The spacious, climate-controlled multipurpose facility will be used for training and conditioning for a variety of athletic programs, and will serve as a game-day hospitality area as part of an effort by Arizona Athletics to enhance the fan experience at football home games. 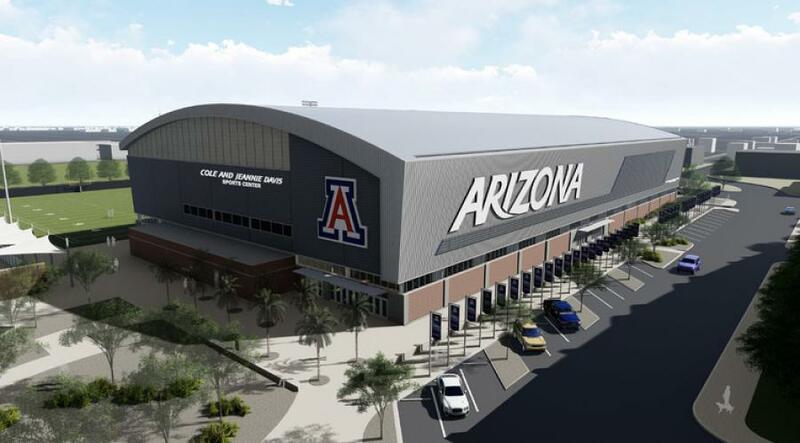 University of Arizona supporters Cole and Jeannie Davis have committed $8 million toward the construction of an indoor sports center, which will include a football practice field. The spacious, climate-controlled multipurpose facility will be used for training and conditioning for a variety of athletic programs, and will serve as a game-day hospitality area as part of an effort by Arizona Athletics to enhance the fan experience at football home games. With their support of the new center, to be called the Cole and Jeannie Davis Sports Center, their giving to the UA has reached a total of $18 million. Their previous gifts went toward renovations of McKale Memorial Center, construction of the Richard Jefferson Gymnasium, renovations to the basketball locker room, the Cole and Jeannie Davis Strength and Conditioning Center inside the Richard Jefferson Gymnasium, and other projects. "What we love about our community and the University of Arizona is the people," Cole Davis said. "Our passion in Tucson is helping young men and women aspire for greatness and achieve their dreams. Student-athletes at Arizona compete at the highest levels as part of a team, strive for success in the classroom and aim to make a difference in our community. We want to make a positive impact on the experience of all the exceptional student-athletes at this great university as they pursue their dreams and become future leaders." The gift is a key component in Arizona Athletics' $66 million capital campaign, which includes multiple projects aimed at enhancing the experience of Arizona's nearly 500 student-athletes, including renovations to the east side of Arizona Stadium, Hillenbrand Aquatic Center, Hillenbrand Softball Stadium and McKale Center locker rooms. Construction has begun on the Cole and Jeannie Davis Sports Center, which has a projected cost of $18 million. "This transformative gift will help us to not only offer an exceptional experience to our student-athletes, but also to offer a gathering place for football fans who visit campus to cheer on the Wildcats," said Robert C. Robbins, UA president. "The Davises' commitment to the success of student-athletes, in every sense of the word, goes well beyond their financial support. With warmth and genuine affection, Cole and Jeannie have made an effort to get to know these talented young people over the years and have been a source of inspiration and encouragement. In so many ways, Cole and Jeannie have made an incredible and lasting mark on the University of Arizona, and we are so grateful for their partnership." Located on the former site of Kindall-Sancet Stadium, the Cole and Jeannie Davis Sports Center is expected to be completed in January. The building will contain a 90-yd. field, with a 10-yd. end zone and a ceiling height of 65 ft.
"What makes Arizona Athletics and the University of Arizona special is our Southern Arizona community," said Dave Heeke, vice president and director of athletics. "Cole and Jeannie Davis are tremendous models of the exceptional support we have in our community. We can't thank them enough for their incredible generosity and commitment to Arizona Athletics, the University of Arizona and Tucson. They are wonderful ambassadors of our campus and continue to make a huge difference in the lives of all our student-athletes. This gift is a vital investment in the vision and mission of our athletics department and university as we continue to educate and develop the next generations of leaders." The Davises have been active philanthropists since arriving in Tucson nearly 20 years ago. In addition to their support of Arizona Athletics, they have made commitments to the UA College of Fine Arts, the Arizona Cancer Center, the Boys & Girls Clubs of Tucson and Casa de los Niños, and other organizations. "The Cole and Jeannie Davis Sports Center is going to have an immediate impact on the development of our student-athletes," said head football coach Kevin Sumlin. "We will be able to shape our off-season work, training camp and in-season practices in a way that allows us to maximize what we do with our team. On behalf of our entire football program, I am grateful for the tremendous support from Cole and Jeannie. Their generosity is an incredible example of our university's vision and commitment to the success of our student-athletes." The Davises are members of the 1885 Society, which is a group that provides unrestricted support to the University of Arizona for advancement in academic excellence. "This game-changing gift builds on an exceptional history of support. The Davis family's motivation to make the UA the best university it can be continues to make a huge difference for our students and our future," said John-Paul Roczniak, president and CEO of the UA Foundation.